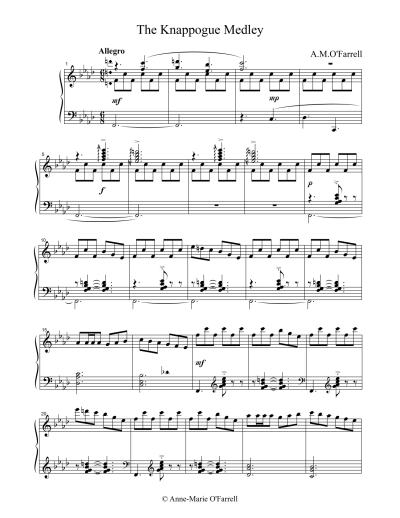 The Knappogue Medley is based on two Irish tunes, The Morrison Jig and Fill, Fill a Run O. 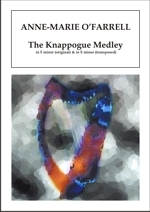 The Knappogue Medley is based on two Irish tunes, The Morrison Jig and Fill, Fill a Rún Ó. This version of The Morrison Jig has been used in Knappogue Castle in Quin, Co. Clare in the West of Ireland, and differs from the standard version of the tune in the B section. Fill, Fill a Rún Ó is a song from Donegal, and is a plea from Roman Catholic mother to her clergy son to turn back from his conversion to Protestantism. It is believed to date from 1739 and to have been written addressing a priest named Fr O'Donnell. The piece is featured on Anne-Marie O'Farrell's album Harping Bach to Carolan presented by Number Twenty Nine and is available on CD. Performance time: Approx. 3' 05"